Being the health and wellness lover I am, I've always been curious about Kombucha, pronounced [kom-boo’-cha]. I vaguely knew it was a fermented drink that takes a long process to make, but is supposed to have the most incredible health benefits. I've always wanted to learn more about it, though, and of course try it out for myself! Thanks to the folks of Kombucha Wonder Drink, I didn't have to wait the long wait a batch would have taken to ferment-I was given an opportunity to try their products right away! "This bottle is an invitation to take part in an ancient tradition. in the Himalayas one hundred generations ago. and energize your body--without alcohol." When the word 'fermented' comes into play, you automatically assume alcohol; In raw kombucha, the possibility of an elevated alcohol content is heightened, however the people of KWD wanted that not to be a problem so they pasteurize their products for safety. It may strip them of the beneficial bacteria, but it's safer and the consumer still receives the organic acids that help the body tremendously. You can choose from 8 tasty flavors: Asian Pear and Ginger, Traditional, Essences of Lemon, Niagara Grape, Cherry Cassis, Essense of Peach, Essence of Juniper Berry, Spearmint and Lemon Myrtle, and Essense of Mango, all of which can come in two different sizes; a 14oz bottle or a 8.4oz can(the can has more limited flavor options than the bottle). 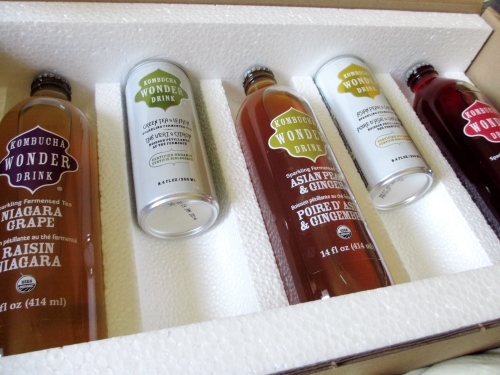 For this particular review, I was sent a goodie box of 4 of their 8 flavors; Green Tea and Lemon, Asian Pear and Ginger, Cherry Cassis, and Niagara Grape. (Note I received 5 physical products, but two of them were the same flavor-one can, one bottle). Not only that, but they came in 3 gorgeous, glass (and recycleable) bottles and two very cute (and recycleable) smaller sized cans. I'll start out by saying that this product probably isn't for everyone's taste palate. While I thoroughly enjoyed all of the 4 flavors I received, if you're not into a slight ACV (apple cider vinegar)/acidic aftertaste, especially in the Asian Pear and Ginger, you might not like KWD. I have unique taste buds and always have, so like I said, I enjoyed all the flavors! My least favorite would probably be the Asian Pear and Ginger because it tasted a little bland to me, however I have a tie for my favorite: Cherry Cassis and Niagara Grape (I'm leaning towards the grape). The product was packaged snug and safely, so I need not worry about anything being broken. The package also came with a bunch of informative paperwork, explaining the flavors, what Kombucha is, what the company offers, etc. Very impressive! Kombucha is supposed to be great for detoxification because it's basically green, oolong, and herbal tea--just fermented. I had to be really careful with drinking this sparingly because I tend to detox fast. I noticed this especially with the Niagara Grape! 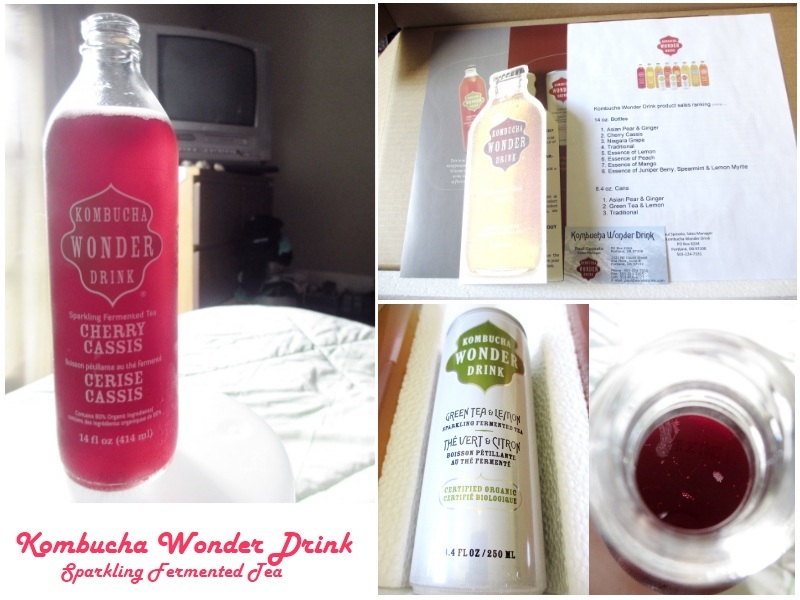 1 winner will receive the same 5-product assorted flavor sampler package from Kombucha Wonder Drink I did! 2. Contest will run from Monday, August 27th, 2012 to Monday, September 10th, 2012. 3. Open to US citizens only--sorry everyone else! That's 1 mandatory entry + 35 possible extra entries which = 36 entries total! Disclaimer: I was provided the 5-product assorted flavor sampler pack of Kombucha Wonder Drink from Kombucha Wonder Drink at no cost to me in order to facilitate this honest review and giveaway. All opinions expressed in the above post are 100% mine and mine alone unless otherwise stated. This contest is open to US residents only and will run from Monday, August 27th, 2012 4:00pm central standard time until Monday, September 10th, 2012 11:01 pm central standard time. The winner will be chosen through Rafflecopter.com and be contacted within 24 hours of the drawing. You'll then have 48 hours (2 days) to claim your prize and send me all applicable information-If I haven't heard from you within that time frame, I will be forced to choose another winner. Thank you for the opportunity! Niagara grape sounds like something I can go for! The Essence of Lemon or Mango sound Amazing! I'd love to try the Mango and the Grape! Love the bottles!! I learned that due to their processing I don't have to worry about bacteria. Kombucha is an energizing beverage with benefits. The ASIAN PEAR & GINGER sounds tasty. I'd like to try the Cherry Cassis. I saw a recipe yesterday for KWD Peach essence with fresh blueberries and they made a smoothie. Sounded delicious! Would love to try these flavors! I'd love to try the Asian Pear and Ginger! They sound like they'll be really energizing - I'd love to try asian pear! I learned that the history of this drink goes back centuries, and originated in the Himalayan foothills. Cool! OHHH! The Asian Pear & Ginger look delish! Asian pear and ginger definitely! I would like to try Essense of Mango!! I know how good this drink is and have read about the many health benefits...these flavors sound delicious! Mmmm Asian pear and Ginger!! The cherry and mango sound great! I would like to try essence of peach. Id love to try mango! I'd like to try the essence of peach flavor. Sounds really good!!! I want to try essence of peach!!! ASIAN PEAR & GINGER sounds good to me! I'd like to try Niagara Grape! essence of peach sounds great!! I've been itching to try the Cherry Cassis! It sounds so yummy! I'd like to try the Asian Pear & Ginger!! I am a regular Kombucha drinker but I'd love to try their cherry! Asian pear and ginger sounds so good! I want to try Essence of Peach. I'd like to try Essence of Mango. I knew someone who made this stuff. It really smelled fermented lol. It is very good for you! looks interesting would love to try. Steve Lee way to go. i'd like to try all of them. I would love to try the Niagara Grape. I'd love to try Essence of Peach! I would love to try Essence of Peach!